First National LGBT Veterans Memorial To Be Built At The Congressional Cemetery In Washington D.C.
Home/Events/First National LGBT Veterans Memorial To Be Built At The Congressional Cemetery In Washington D.C. This week it was announced that a National LGBT Veterans Memorial is being built at the historical Congressional Cemetery to honor fallen LGBT servicemen. The Congressional Cemetery was established in 1807 and was America’s first de-facto national cemetery long before Arlington National Cemetary was created. The Congressional Cemetery is not owned by the government but by nearby Christ Church and takes its name from the fact that so many historical figures, including some 80 members of the Senate and House are buried there leading Congress to periodically contribute to the upkeep of “The Congressional Burying Ground”. The memorial, says organizer Nancy Russell, is meant to be a visible and lasting testament to the contributions that transgender, bisexual, lesbian, and gay service members have made to the security of the U.S. The board of directors of the National LGBT Veterans Memorial have already bought the plots and are seeking design submissions for the monument from artists across the country. 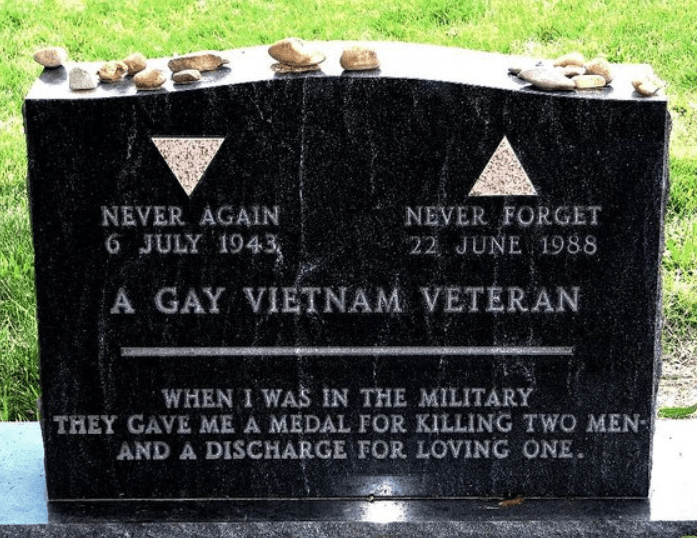 Matlovich who was discharged from the Air Force in the early 1970s for being a gay man is already buried at the Congressional Cemetary and his tombstone is a significant attraction for visitors to the Cemetery for its poignant inscription “They gave me a medal for killing two men and a discharge for loving one. When he died of AIDS in 1988, Leonard could never have imagined that so many individuals gays and gay couples would choose to be buried near him — or that some would even coose to be married next to his grave. While, in fact, he intended his own gravestone to be a memorial to gay veterans (which is why it doesn’t bear his name), this will be a wonderful, long overdue extension of his idea. Recently, in a first imaginable to virtually no one back then because the technolgy didn’t exist yet, he became the first gay activist to have his own “Quick Response [QR] Code.” Previously used mostly in museums, Washington DC’s “Congressional Cemetery is now the world’s largest outdoor encyclopedia of American history, with encyclopedia articles available with a quick scan by a smartphone of QR codes that are placed next to the Cemetery’s stone monuments. The phone will then display a Wikipedia article on the person buried or memorialized on the site, in the preferred language of the owner of the phone. Six QR codes were tested at the Cemetery including those next to the cenotaphs of President John Quincy Adams, and pre-Civil War congressional leaders Henry Clay and John C. Calhoun, abolitionist Owen Lovejoy, and Cong. Tom Lantos, but the most popular scan was for the article on Vietnam veteran and gay activist Leonard Matlovich.” – Wikimedia. Happy with the project’s response, now over 60 graves/cenotaphs are coded. Leonard’s Wikipedia entry is currently available in four languages.